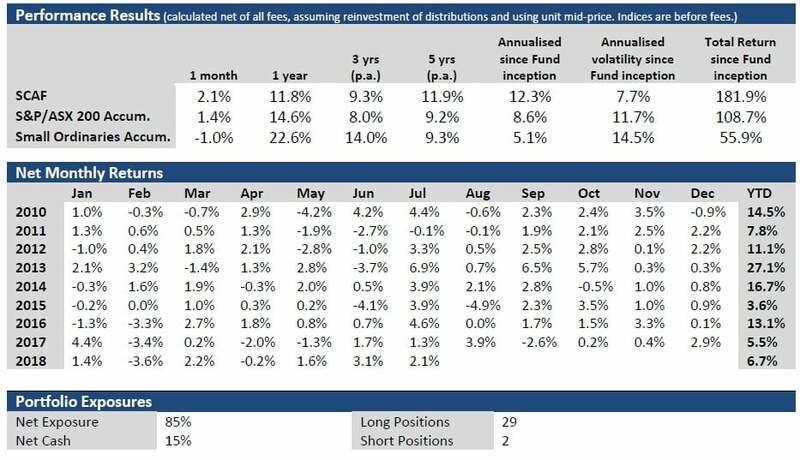 Sandon Capital Activist Fund commentary for the month ended July 31, 2018. 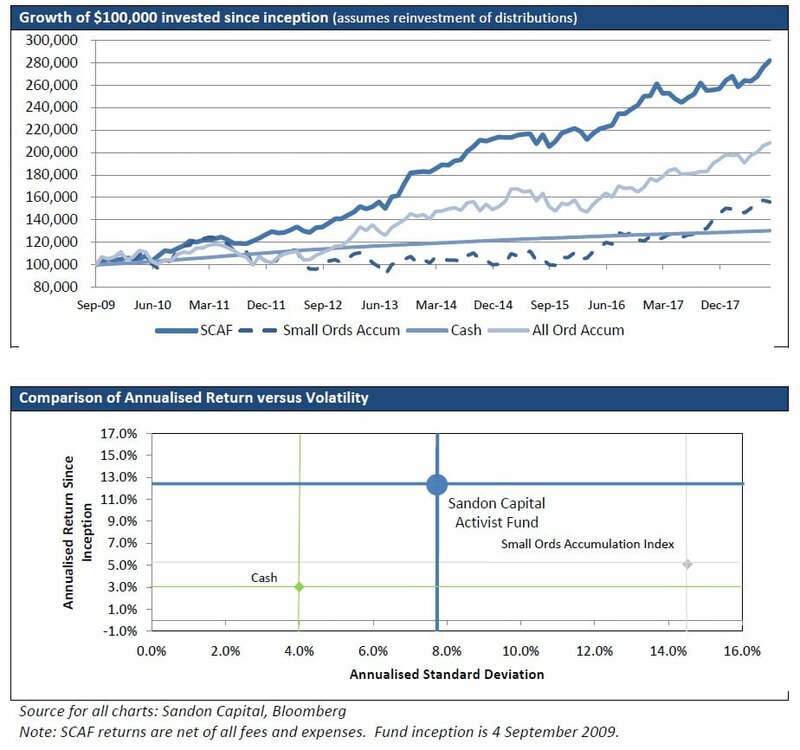 The Sandon Capital Activist Fund return for July was 2.1%, bringing total returns (net of all fees and expenses) since inception to the equivalent of 12.3% per annum. Cash levels ended the month at approximately 15%. Fleetwood Corporation Ltd (FWD) (~1.4%) was the main contributor for the month. Consolidated Operations Group Ltd (COG) also made a meaningful contribution for the month (~0.7%). Specialty Fashion Group Ltd (SFH) was the main detractor (~-0.5%), the result of no apparent news regarding the company. FWD contribution to this month’s return was the result of the announcement of two acquisitions and the ensuing capital raising. FWD is acquiring two businesses, one which has a contract to build modular prison cells in NSW and the other is a caravan parts business which FWD plans to bolt on to its existing parts and accessories business. The acquisitions were funded by a combination of institutional placement and non-renounceable entitlement offer at $1.80 per share. Despite not being enamoured of the acquisitions and remaining critical and sceptical of FWD’s Board and management, the price offered an opportunity to acquire more shares at an attractive price. Sandon Capital and its associates exercised all entitlements and participated in the placement to maintain its proportional holding in FWD. COG reported during the month that its TL Rentals leasing business had exceeded the lease origination guidance ($58.7 million versus $55 million). This represented a 38% increase on the prior period and the company announced it was targeting lease originations in FY2019 of $70 million, growth of more than 19% on FY2018. COG also announced that it would move to 100% ownership of its 80% owned subsidiary Consolidated Finance Group (CFG). CFG provides membership based services such as access to lenders and compliance services to 126 finance broking firms. Aside from the business merits of this acquisition, it will also further simplify COG’s ownership of key operating subsidiaries, making the financial analysis of COG’s business a little easier. We believe COG has been taking positive steps to improve its engagement with prospective investors, including participation in a broker roadshow. We eagerly await its results, both for the numbers, but also to see how these are communicated. The objective of the Fund is to deliver returns to investors through a combination of capital growth and distributions. The Fund aims to achieve this objective by seeking to invest in opportunities that are considered by Sandon Capital to be trading below their intrinsic value and that offer the potential of being positively influenced by investors taking an active role in proposing changes in the areas of corporate governance, capital management, strategic and operational issues, management arrangements and other related activities. Neither returns nor capital are guaranteed.